Yesterday—June 1—was National Donut day. When we moved into our current home thirty some years ago, we noticed a Dunkin Donuts about a mile away. A special treat was a dozen or two of those donuts with each person have particular favorites brought home after good report cards or ‘just because’ events. The owner of the franchise used to offer his store as a field trip for the kindergarten class of the school my sons attended. They each got to fill a donut with cream and then eat the result. For a long time, my middle son wanted to be a donut maker when he grew up—he actually turned out to be an inventive mechanical engineer. My mother would make donuts once a year—right after she rendered the lard from the hog butchered each fall. The locker plant would send home boxes of neatly wrapped meat selections done to my mother’s specifications—so many pork chops in a package, sausage in such a size—and then there was the huge boxes of lard cut away from the meat for her to process at home. It was a messy project with the smell of grease cooking—and then there were the cracklings which she used to just toss until a neighbor lady saw them and asked if she was going to make crackling cookies. Of course those were fabulous—and easy—and we all loved the donuts she would make as the last thing she did before ending the rendering project. We all fought over the treasured chore of shaking the hot donuts in a bowl of sugar as we were granted a sneak preview taste of those donuts. 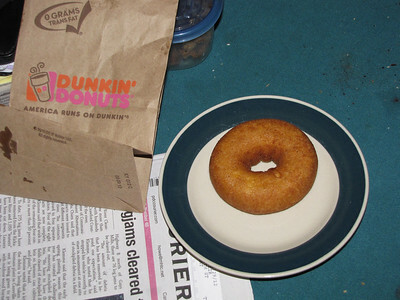 So yesterday after a long day of work in which there was no time to eat lunch or supper, I stopped at the Dunkin donuts at the end of my street. The racks were pretty bare as they gave away a donut with the purchase of a beverage. I really didn’t want coffee as I planned on crawling into bed but that old-fashioned donut was quite tasty.